This front mounted intercooler by Forge Motorsport is designed specifically for the US market version of the turbocharged FIAT 500 ABARTH and 500T. This front mounting intercooler comes with all associated hoses, pipes and fittings, that replaces the existing side mounted intercoolers. 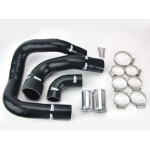 This unit was developed to be suitable for those running standard turbos and ECU software (standard vehicle + 10 hp, +10 ft/lbs torque) and also those with larger turbo conversions. Whilst the factory set up using the two intercoolers in parallel is reasonably efficient, the removal of the long lengths of small bore pipework, quickly lowers the circuit resistance allowing you to benefit from the true capabilities of the turbocharger. Combining this with an increase in intercooler surface area and volume, along with siting the intercooler at the front of the vehicle, we really do have winner. The UK version of this intercooler is pictured. The US version will vary slightly. Updated pictures coming. 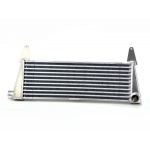 Due to unprecedented demand, Forge is shipping us a US specific intercooler, but it is supplied with the UK version fitting instructions. They are working on US version instructions which will be included as soon as possible.